Kingsley Burlinson, Burlinson Geochemical Services P/L. Gold deposits from thick sedimentary sequences, lacking volcanic units and with only a poor relationship to granitic plutons are of considerable interest because of the large quantity of gold mined in the Central Victorian Goldfields in Australia in the late 1800s. The gold occurs in quartz veins hosted in Ordovician slates and greywackes and is structurally controlled by faulting and anticlinal hinges. Saddle reefs in Anticline hinges were a major source of the gold in several areas. The Meguma terrane of Nova Scotia shows substantial similarities with the victorian goldfields, and has numerous gold workings. By analogy with the victorian goldfields it is inferred that this area has additional untapped potential which has not been realized due to the greater difficulty of exploration because of the thick vegetation and recent glaciation. Fluid inclusion information could help with exploration for these deposits by facilitating the discrimination between different generations of quartz and perhaps directly identifying quartz which hosts gold. This compilation of existing data from these areas shows that there are significant variations in the decrepitation patterns in the quartz. Different generations of quartz can be identified and in many cases a quartz with a high level of CO2 rich fluids in the fluid inclusions seems to be the main host for gold mineralisation. 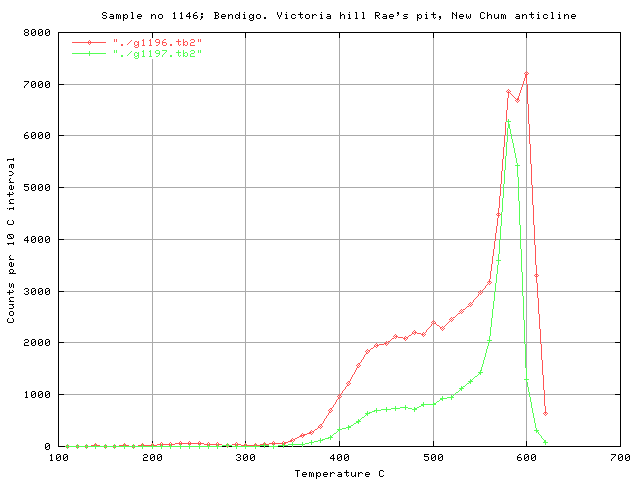 The presence of CO2 rich fluid inclusions, as shown by decrepitation below 300 C, is the most noticeable feature of the samples from across the Melbourne province and at The Ovens in Nova Scotia. There is tendency for auriferous samples to show CO2 rich fluids, but this relationship is confused by the lack of complete geological and spatial relationships of most of the samples. The lack of CO2 on the Dufferin deposit in Nova Scotia is surprising, but only 2 samples from this deposit have been analysed and additional sampling is required to determine if this is a consistent difference. 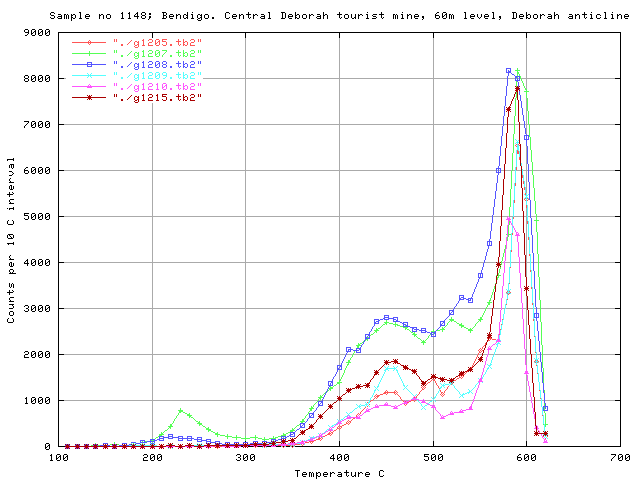 In a few places it was possible to sample spatially overlapping, different generations of quartz, such as the Deborah mine in Bendigo and Ballerstedt's cut in Bendigo, and markedly different decrepigrams confirm that one can clearly distinguish between these quartz events. This also confirms that the quartz in many cases was not a single event, but multiple events, not all of which may have been auriferous. 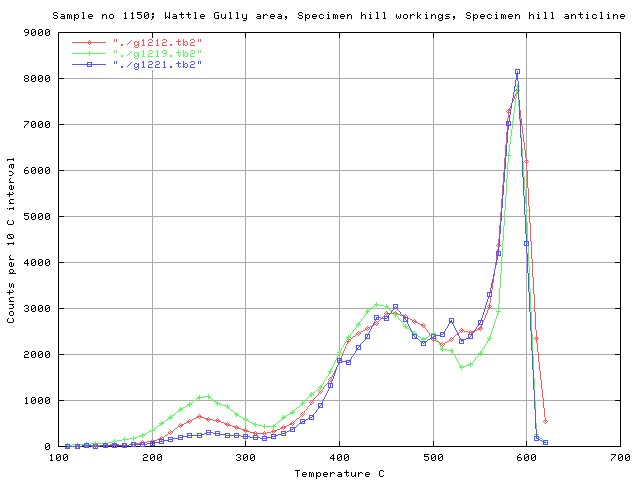 There are variations in the temperature of the main peak from 400 C to 500 C across the samples. 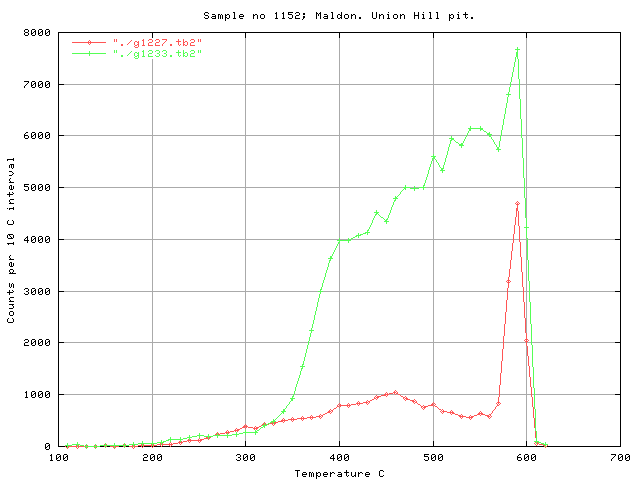 this probably reflects changes in the formation temperatures of the quartz from about 320 to 420 C. On this limited data set it is not possible to discern the causes or implications of this temperature variation, but it may prove to be useful as an exploration guide given a more thorough orientation study in an area of interest. The samples from Dufferin, Nova Scotia, had unusually low levels of decrepitation, and also significantly higher decrepitation temperatures than most of the Victorian samples. 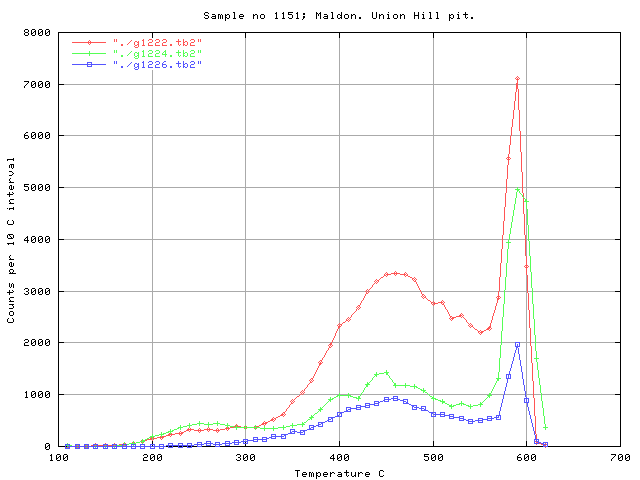 The high temperatures are similar to samples from Maldon, Victoria, and one of the samples from The Ovens, NS. The Maldon mine is more closely related to a nearby granite than most other Victorian deposits, which suggests that the 2 Nova Scotia deposits sampled to date may be closer than usual to granites, in contrast to a more distal relationship with granites as seen at Bendigo and Ballarat. The decrepitation method can easily recognize the high CO2 content fluids that are common in these types of deposit. It also discriminates between multiple generations of quartz which are often spatially overlapping and visually indistinguishable, although important in the context of mineralizing events. Subtle variations in dominant temperatures in the decrepigrams may also be useful in recognizing auriferous quartz phases in an exploration context. The method is applicable in the metamorphic regimes of both of these provinces, and given a carefully planned orientation suite of samples, could be a useful exploration technique in these areas to identify potentially auriferous quartz. Samples are plotted in groups by sample number (collection location). The presence of decrepitation at low temperatures, between 200 and 300 C is indicative of high CO2 contents in the inclusions. This is the simplest means of discriminating between sample types and often helpful in discriminating between auriferous and barren quartz. 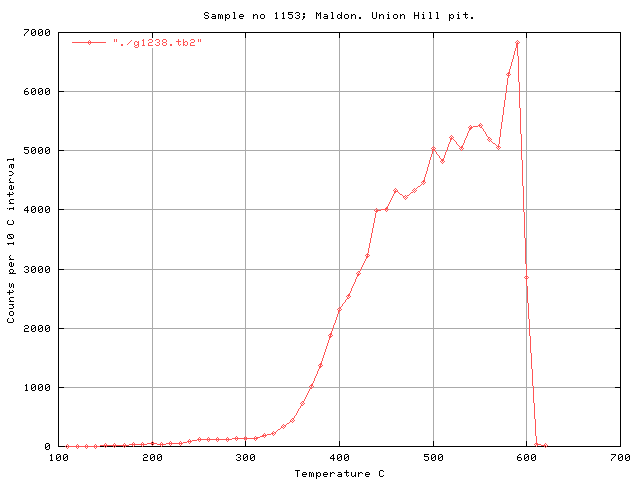 Decrepitation analyses of the "G series" were not stored in electronic format and these results have been manually re-entered from paper copies. This group of 32 samples has been selected from the total of 129 samples collected on the Gold '88 excursion to the central victorian goldfields, Ballarat province. An excursion to visit the Victorian goldfields was held after the Gold '88 conference in Melbourne in 1988. These samples were collected during that excursion. Access limitations prevented collection of any samples from Ballarat. 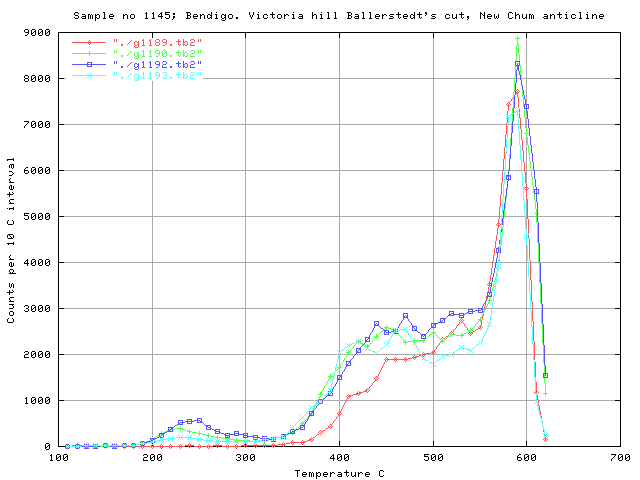 This summary deals only with samples from the Ballarat province, which includes the Bendigo area mines. In this province, gold deposits are hosted within Ordovician shale and greywacke sequences. The most productive gold regions coincide with zones of high density of faulting. From "Geology of Victoria", 2002, in press. mineralised structures are mostly confined to fold zones with a sub-horizontal enveloping surface located several kilometres west of major regional faults (Willman, 1995). In these areas, the dominance of west-dipping mineralised faults suggests a genetic link to the larger-displacement, yet unmineralised, regional-scale west-dipping faults (e.g. Muckleford and Whitelaw faults). Important similarities have been recognised between the Victorian gold province and the Meguma Terrane of Nova Scotia, although the total gold production from Meguma is only 40 t Au from 60 small deposits (Kontak & Smith, 1993; Kontak et al., 1991, 1993). The Meguma Terrane consists of a Cambrian to Devonian turbidite-slate sequence like Victoria, but without equivalents of the Cambrian metabasalts. A major Devonian thermal and deformation event that may be slightly diachronous across the Meguma Terrane has also been inferred. The major intrusion in the terrane, the South Mountain batholith, is peraluminous (Allan & Clarke, 1981) and remarkably similar to the Strathbogie Granite. Meguma gold mineralisation is primarily associated with pyrrhotite and arsenopyrite with some stibnite and limited pyrite. The proportion of deposits with strongly folded quartz veins may be higher in the Meguma Terrane compared to Victoria. the mineralisation. Elevated concentrations of CO2, K2O, S, Au and As, together with low Na2O, are also indicative of gold-related alteration. Further work needs to be done to determine if potentially economic zones of mineralisation can be predicted from their geochemistry, and to better understand what controls the distribution of ore shoots. On the excursion, samples were collected at Lancefield, Fosterville, Bendigo, Wattle gully and Maldon. The locations are shown on the following map, together with the important Ballarat location, which could not be sampled on this tour. Location map of Gold '88 excursion sampling, Ballarat Province, Victoria. There are no gold workings at Lancefield and this area was sampled as background for comparison. 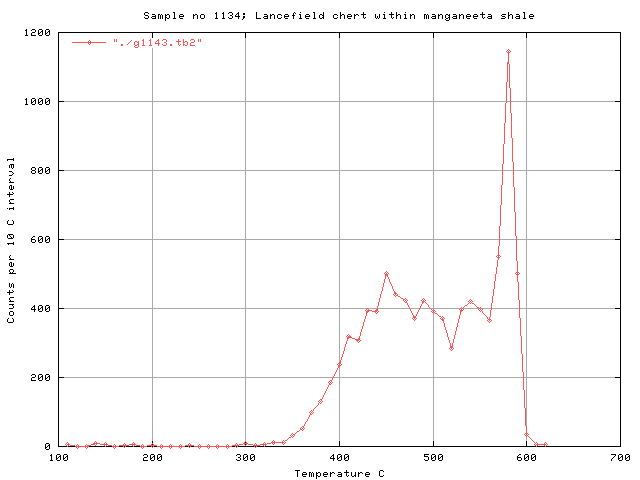 All but one of the siliceous samples from Lancefield were of chert which showed no decrepitation activity at all, as would be expected as there are no high temperature fluid inclusions in such materials. Note that the regional metamorphism has not introduced metamorphic fluid inclusions into the chert. The decrepitation method is not subject to interference from the effects of metamorphism, at least up to greenschist facies metamorphism. One sample from Lancefield was of vein quartz and has a typical decrepitation signature which lacks low temperature CO2 rich fluid inclusions. In 1988 Fosterville was an exploration prospect, but is now an active mine. A suite of 24 samples was collected and these are discussed in full in a separate page here. Fosterville is one of the few Victorian deposits in which the gold is disseminated in the host rock rather than concentrated in quartz veins. 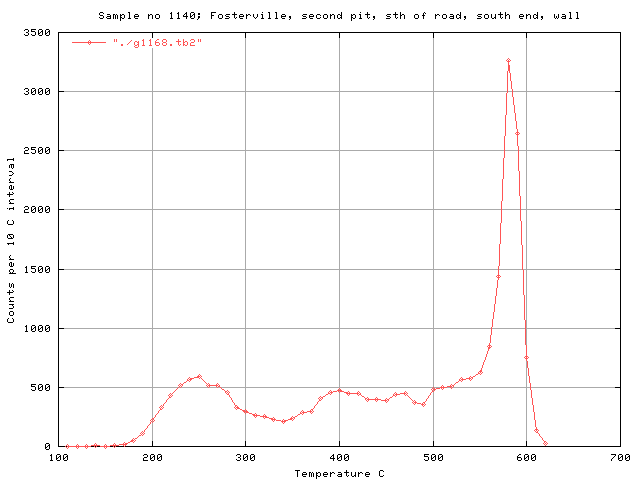 The Fosterville samples tend to show a CO2 peak, which is especially prominent in sample 1140C, shown here. See the complete discussion of the fosterville samples here. The main part of the Bendigo goldfield has a strike length of 17 km (7 km being productive), is up to 4 km wide, and is remarkable for its regular trains of chevron folds that control the distribution and geometry of mineralisation. Most production was derived from the hinge zones and east limbs of three anticlines, namely the Garden Gully, New Chum and Hustlers anticlines, but significant gold was also mined from adjacent anticlines. The whole goldfield is confined to a zone of symmetrical and persistent folds with the eastern edge of the goldfield being sharply delineated, and the western margin coinciding with a more gradual decline in production and number of mineralised structures (Willman & Wilkinson, 1992). Mineralisation is mostly hosted in reverse faults. Many of the smaller faults appear to be true limb thrusts that have short dip lengths and were generated as fold-accommodation structures after fold lock-up. However, some of the larger mineralised structures may have more significance regionally and extend to a greater depth. The famous saddle reefs are fault-controlled composite structures which range from being a folded bedding-concordant vein through to complex structures involving the interaction of limb thrusts, fold hinges and bedding-concordant veins (Willman & Wilkinson, 1992). Detailed stratigraphic correlation across folds suggests that the mineralised intervals on adjacent anticlines may represent similar stratigraphic positions (Johansen, 1998). 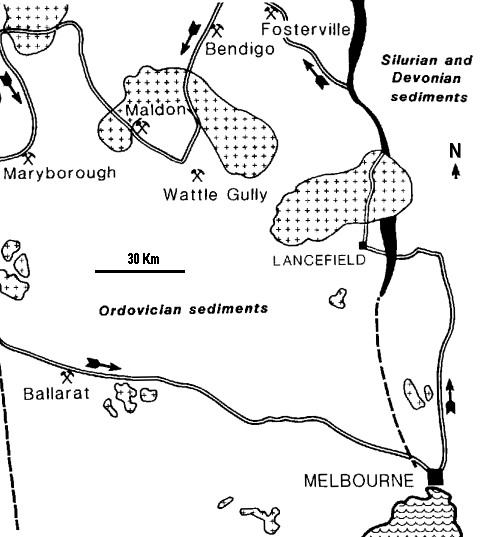 The west-dipping reverse faults and associated extensional vein zones are similar in character to those at Ballarat, Castlemaine and Daylesford. For example, the Deborah Fault is interpreted to have a strike length of more than 1 km and is associated with minor east-dipping splay faults (Turnbull & McDermott, 1998). Domal culminations along the main anticlines tend to correspond with well-mineralised portions of the folds. 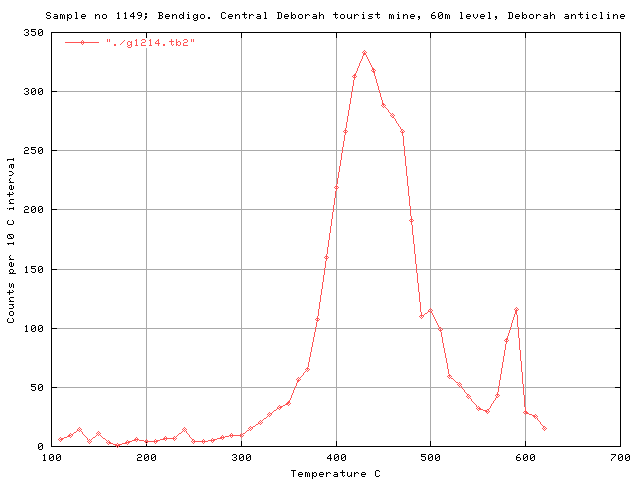 Overall, folds in the Bendigo goldfield plunge about 10 degrees away from the centre of the field. 1 - 1143 Presumed barren quartz in the very productive Paddy's gully anticline. 2 - 1144 Diamond hill , Napoleon anticline, presumed barren quartz. 3 - 1145 Victoria hill, Ballerstedt's cut old workings in the very productive New Chum anticline. 3 - 1146 Victoria hill, Rae's pit old workings in the very productive New Chum anticline. 3 - 1147 Victoria hill, mullock from old workings in the very productive New Chum anticline. 4 - 1148 & 1149 Central Deborah mine, underground samples, productive Deborah anticline. The other very productive anticline in this district, Hustlers, is off to the east of this map. The Paddy's Gully anticline is also known as the Garden Gully anticline. The New Chum anticline is also known as the Nell Gwynn anticline. In Bendigo, there are many anticlinal axes and saddle reefs on many of them have been exploited. The samples from the Paddy's Gully anticline are remote from any known workings and presumably barren although this anticline was one of the 3 most productive in the district. Sample #1143A below contains CO2 although it is distant from the productive sections on this anticline. It may be an indicator of the nearby auriferous potential of this anticline. The napoleon anticline is rarely mentioned as mineralised and this is considered to be a barren sample. Note that it lacks CO2. 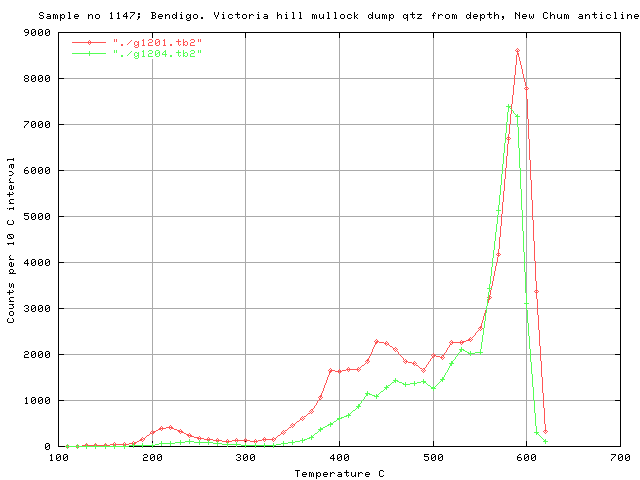 The Victoria hill samples are from old workings on the very productive New Chum anticline. Note that the different orientation quartz veins (1145A is perpendicular, the others are parallel to the axial plane) show a different response and the different generations of quartz in one location can be distinguished. Here again, the axial plane perpendicular sample (g1197, #1146D) is distinct from the axial plane parallel sample, having lower counts at 400 to 500 C.
The euhedral mullock quartz is quite possibly a late stage barren quartz. Its different decrepitation pattern and lack of CO2 probably represent barren quartz. Run g1201, Sample 1147A, Quartz within unoxidised shale. 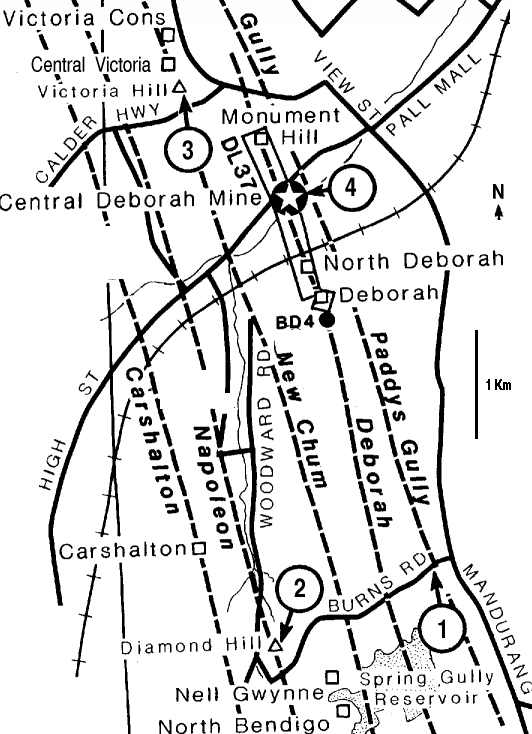 The Central Deborah mine was one of the most productive in the Bendigo area. 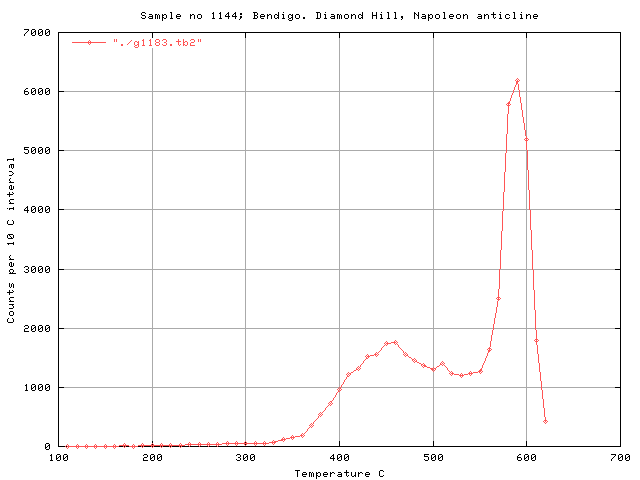 The auriferous quartz (#1148C & #1148D) show a high CO2 content, while barren and doubtful samples lack CO2. Although the samples 1148B and 1148C are closely related, they have markedly different CO2 responses indicating the presence of small scale inhomogeneity and zoning, even within mineralised quartz of the reef. 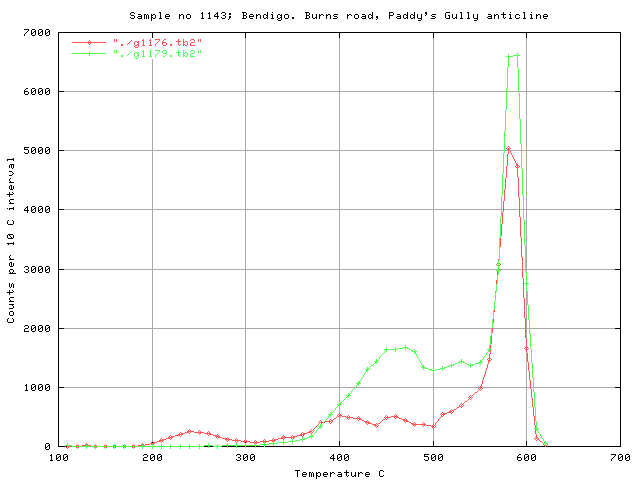 Closely related quartz from the centre (1148B) and margin (1148F) of the same vein both lack CO2, and are indistinguishable from each other here, but distinct from the presumed barren sample 1149 (graph below), which has a slightly lower temperature peak at 430 C.
All of the samples collected at Wattle Gully in the old Specimen hill open cut pit had substantial CO2 contents. The quartz veins seem to be of a single stage only with consistent decrepitation patterns on all samples. There are several different decrepitation styles indicating a complex quartz paragenesis at Maldon. Most samples contain low level CO2 peaks but it is unclear how the decrepitation patterns relate to mineralisation other than noting that the one pit contains many different quartz styles. Run g1238, Sample 1153C, Thin vein, west of ore zone, out of best ore.
Several different types of decrepitation pattern occur on these samples collected from a range of deposits and background areas in central Victoria. The most noticeable pattern is that due to the presence of CO2 rich fluids in some, but not all samples. There is also a tendency for these CO2 rich samples to be related to known mineralised samples in most cases. The variations in decrepitation can be used to distinguish different types and parageneses of quartz and potentially to identify auriferous quartz. Using fluid inclusions rather than gold analyses to identify auriferous quartz would be advantageous as one may be able to identify distal variants of the mineralised quartz where the actual gold content is too low or too spotty to be analysed reliably. A complex small scale zonation of the quartz can be seen, indicating that the quartz deposition was not a single event. It is not resolved from this data if the gold mineralisation is constrained to just one (or a few) of these quartz events, but it is clearly not associated with all the quartz events. Contrary to some biased opinions which have been expressed, quartz samples in these types of deposit are not uniform and invariant, but are of multiple parageneses and the fluid inclusion decrepitation technique can be used to discriminate between these different quartz materials. Understanding of these variations would be of considerable practical utility in exploration or exploitation of the gold deposits hosted by this quartz.